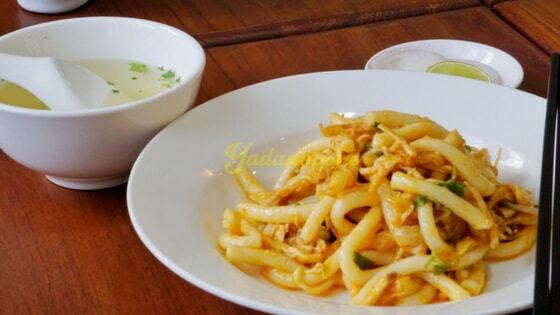 Nan Gyi Thoke is Myanmar’s favorite Khow Suey salad and the authentic taste of it is unforgettable. This Khow Suey Salad is unique because it doesn’t require any special-sauce and all you need is chicken-gravy to make the salad. But if you are vegetarian, you would not be able to get a taste of it. But don’t worry. There is a way to make vegetarian Khow Suey Salad and it will taste as special as the original one. Here is how to prepare tasty vegetarian Khow Suey salad (Nan Gyi Thoke). Firstly, heat the oil and add some turmeric powder. Then, add onion and garlic and stir them until they become red and fragrant. After that, you can add the tofu. You need to stir it nice and soft because tofu is too fragile. When the tofu become quite hard, you need to add some chili powder and stair it for a while. Then, you may season with salt and simmer it in a low heat. Be careful that the tofu won’t stick on the base of the pan. So, it is better if you use non stick pan. During the whole process, you need to stir as gently as possible. Put some noodle in a bowl and add tofu gravy. Then, you can add one teaspoon of peanut oil or your favorite oil and chickpea powder. You need to make sure that the chickpea powder do not gather at one place and spread everywhere evenly. If you are a fun of hot meal, you may add some chili powder in the salad. In order to make the salad more rich, you may add boiled bean sprout, shredded cabbage, some coriander leaves, and rings of onions. At the end, squeeze some lime juice on top, and mix it nice and well. Normally, people top nan gyi thoke with boiled egg. But if you are a strong vegetarian and you don’t even eat egg, you can just top it with crispy-fritter. You may also add some deep-fried vegetables or pea. Now you can enjoy the tasty vegetarian khow suey salad and we guarantee that you will love it.